Salinas de Antigua Golf Residential Complex in - Fuerteventura, is a resort of superb villas and apartments beautifully incorporated into a splendid 18 hole golf course, designed by Manolo Pinero. With only a short walk to commercial centres, bars, restaurants, and the main town of Caleta de Fuste makes Salinas Golf the perfect Golfing Location in - Fuerteventura. The three bedroom villas built on plots from 800 square metres and the two bedroom apartments on plots of 300 square metres are the perfect setting to enjoy the many pleasures Salinas Golf has to offer. 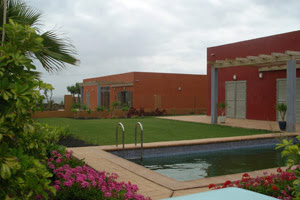 -Fuerteventura offers you the best landscapes of canary Islands, if you like to relax, playing golf in a great place such as - Fuerteventura , come over and buy or rent a house.